There are classic symptoms of Kawasaki Disease, the problem, though, is every case is different. This rare disease is characterized by an inflammation of the blood vessels throughout the body. There is no specific test for Kawasaki Disease; doctors make a clinical diagnosis based on a collection of symptoms. The one thing to remember is to trust your instinct. If you believe your child has Kawasaki Disease, ask the doctor for an echocardiogram to distinguish if inflammation is present. Diagnosing Kawasaki Disease within the first 10 days is CRUCIAL to prevent long-term damage, including heart disease. One or more of these symptoms may be present. Remember every case is unique. Be sure to track symptoms and the number days from the start of symptoms so you have a record to share with your doctor. Read our Kawasaki Kid stories to learn how unique Kawasaki Disease can be for each kid. Fever of 102F+ (39 C+) and lasts more than five days. Be aware that this may be the only symptom! 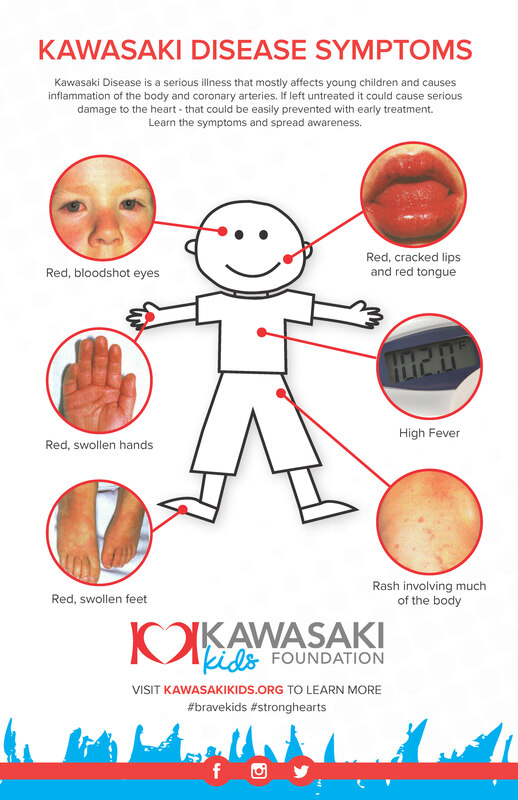 Order Kawasaki Disease Symptom posters and distribute them to your local doctor's offices and health clinics.